Brusilia tower at the Josaphatpark. Architect Jacques Cuisinier, who also built the regretted Martini-tower, loved the modernist ideas of high buildings and green surroundings. This man, Oscar Niemeyer, built Brasilia, capital of Brazil, not Brusilia. But if we want it or not, both will influence the design of the apartment. The plan is, unlike the tower, very classic. Many doors and claustrophobic, however the apartment is big enough, more than 200m2. We remove it all. A new floor in oak herringbone pattern goes all the way to the extremities and finally we feel the space. We put very few walls, just where we need it: bathroom and buanderie. After that we can reorganize the whole area, like a new small city. The composition of three closets, the kitchen and library will create new rooms. All rooms will interfere and have a relation to each other, opposite to what it used to be. Sliding and pivoting doors in differtent colors, will create a flexibility which turns the apartment into a twisting movie with different plots. Together with the cinematographic views to the outside, it is an ideal spot for the inspiring clients, two directors. All pictures by Tim Van de Velde. The house is settled in a very green and silent area of Brussels. The house forms a balanced composition of volumes, built in the thirties. It looks like a rather tall lady, proudly standing on its ground. The rear view shows clearly the kitchen and the storage room, as two attached volumes. The garden is organized around the house and has no direct relation to the house. There's a house and a garden, with few interaction. The client wants a dining room with full view on the garden, an extra bathroom and a seperate unit for music and relaxation. We all want it to be light. Light in structure, opposite to the massive brick. Light like Richard Neutra. Here for example his House for Mrs. Miller, Palm Springs, 1937. A portrait of Richard Neutra. Frigthning eyebrows but what an architect! We will not try to follow the style of the house. We add the volumes as they are. One on top of the kitchen. One on the corner. Vertical composition. And we move the music room to the side of the house. Horizontal composition. In a first lay-out we build the dining room and the kitchen. Secondly, we add the music room and the garage is removed. The bathroom is placed on top of the kitchen. Look at Mrs. Miller, enjoying the outside from the inside. 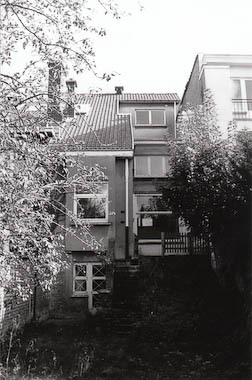 The back side of the house, with the music room on the left and a long elevated passage. At the right, the dining room and on top of the kitchen, the bathroom with etched glass. 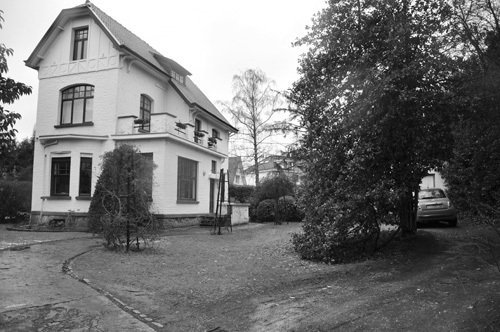 The street side of the house, with on the right the sunken music room and carport. The section makes it clear. Back and front garden are now clearly marked by the location of the music room which is sligthly sloping down. Street view. Neo-classical at the outside. Preliminary sketch of the interior. The stairs and ramp show you the way. For aesthetical and commercial reasons: let's break down these windows. Three levels: presentation, taste and demonstration. Displays in wood on different white layers. Colorful and stylish products, so we will provide a smooth and discreet blueprint. Wood and White. First, the big plan. Keep on moving. Supported by the ramp and shelves. Secondly, stopping and looking near tables. And at last, the boxes and the lighting. All photos by Filip Dujardin. Once in Ghent, in the Vlaanderenstraat, near t’Zuid. A small shop with a large window. Two scales. Big and small. The interior has nothing special. We start from zero, for a new store for Christa Reniers. On the right is the entrance, both for inhabitants of the apartment building and visitors of the shop. We focus on the left entrance, a huge door. In search of spirit and emotions. Here’s Frank Lloyd Wright…’how to live in the Southwest’ 1950. The store of V.C.Morris in San Francisco by Frank Lloyd Wright. Lighting details, carpet, color, a total engagement. We wanted a shop, as easy to construct, as easy to remove. 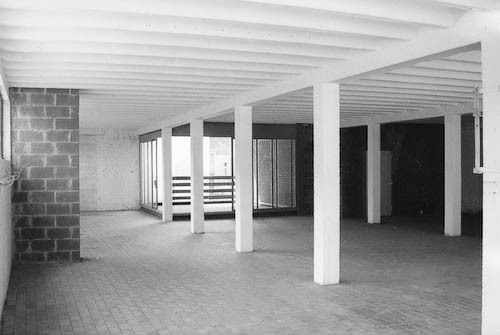 The new shop as a temporarily pavilion, inserted and placed within the outlines of the existing space. No false ceilings, no false walls, no false floors. Just wood. Wood in abundance. Like in the work of art by Mikael Hansen (Organic highway – Danemark 1995). Beams. 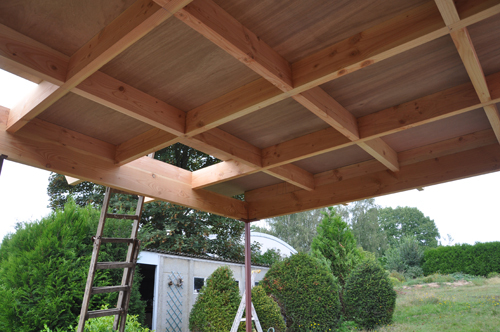 Wood, pitch pine in its simplest form, construction beams. Stapled, on its side as a wall, next to each other as a floor, with intervals as a screen, stuck together as a display. Roughly sawed and drained in white. In circular, triangular and rectangular forms. Even smaller than before, the shop fits around you as a cloth. As a second skin, melted into proportions and rhythms, to please. After the gateway there is an alley. Deep and dark. At the end of the alley, there is light. An abundant light. In short: everything is there for some scenic architecture. A door, a walk, the light. An ideal spot for literature, the House of Literature Passa Porta. Bookstore, conferences, performances, exhibition and study. What we add is rythm and proportion. Three windows in a line, articulations of new doors and windows in white painted steel, the creation of new openings and access to a new level: the former cellar becomes a conference room. The concrete floor is the linking part of all the adjacent spaces. Every smaller space stands on its own, but is always linked to the central space, domed with light. Furniture in this white open space can be massive, wood, strong, basic. Like the furniture Donald Judd designed in the Chinati Foundation,Texas. We propose wall units for books, tables, podium, all in plywood, pine. They form a warm welcome of books, between the red ‘bruneau’-chairs and the stylish Erco lighting. Bookshelves as repetitive units, forming walls of books. One wall climbs to the ceiling, incorporates a bench in plywood, and hides a translation desk corner. Tables in plywood, to lean on, to have a coffee, to expose books. Loads of concrete trucks block the road. The construction time is limited. Three/four months. The opening of the House of Literature with the original plywood wall-units. New renters have not respected the original layout and furniture finishing. The house was old, worn and not practical. It is not a townhouse, it’s not a villa. It’s something in between. The plan of the old house. As always: an original house in front, extensions in the back. Between the high houses on the right and the low garages on the left. Restart from zero. It is definitely a house on the corner. How should we unite the back with the front, the high with the low. Bring in the light and the sun! Opening up, closing in, at the same time. Trial by error models. From the garden to the street, we play with high and low, light and dark. The living room is high, then low again, then high at the staircase, and low again in front, but the first floor is high and then up to the sky, the attic. Aalto loved these strong emotional feelings, the continuous movement of spaces. Strong textures emphasizes these experiences. Here’s the church of the Three Crosses in Vuoksenniska. Siza loves Aalto, as I love both. The way Alvaro Siza takes care of the proportion between stone and plaster inspires me. Texture helps to scale the building to it’s surroundings. See Siza’s Alicante University. High and low on the inside. High and low on the outside. Walls and windows guide you through the house. Black concrete on the ground floor, birch interior wood details and white plaster create an overall calmness. The section reveals the interior relations, constantly switching the in and the out. All photos by Vercruysse and Dujardin. A wonderful square in Antwerp, Vrijdagmarkt, completely destroyed in WorldWarII. Everything is fake. The ‘neo-renaissance’ facades are of poor quality, build in the fifties. The makeover of the outer space, the square, was more important than the inner spaces, the houses. 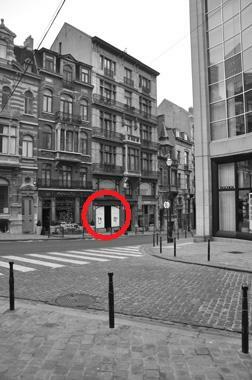 On the corner of the ‘Leeuwenstraat’, a shop will be build, to expose jewellery for Christa Reniers. 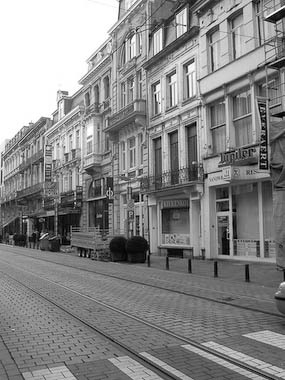 The Nationalestraat, the heart of Antwerp Fashion is just near. Many, many m2 available. How to create a shop for small objects in this large, unstructured chaos of beams, columns and windows. Let’s lower the ceilings, to create floating spaces. And articulate the ceilings like Aalto in his Villa Mairea. Let’s play with structures and texture, to feel at home, to share emotions. Like the path of the house of architect Jean van den Boogaerde: stone, concrete and wood as a guide. The ceiling is low, 2m26, exactly what you need for a pleasant low ceiling (Modulor), roughly sawed cedar drained in white. You can touch it if you want. The view to the outside, the square, must be part of the inside. A dynamic space, turning around a column, again and again. A façade of white concrete, as a play of elements. Too much of a play they said at the Town council. We try again. And we will calm down. Study the proportions. View from the square. The city liked it this time. We got a nomination, with exhibition for Antwerp’s most beautiful store in 2007. And also nominated for ‘de nacht van de architectuur’. The full view into the shop, the entrance at the side, the exposed jewels, a relax zone with a view, the table as a welcome, the mirror on a corner, the layered column, the never-ending feeling. This is a building block in the center of Brussels. 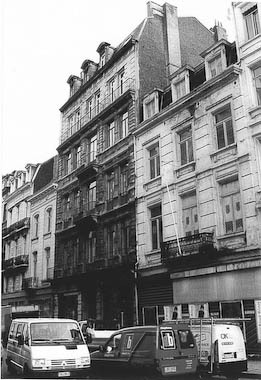 Defined by Dansaerstraat-Rue Antoine Dansaert, Rue des Chartreux-Kartuizerstraat and Rue du vieux Marché Aux Grains-Oude Graanmarkt. In the middle lies a unique building plot. 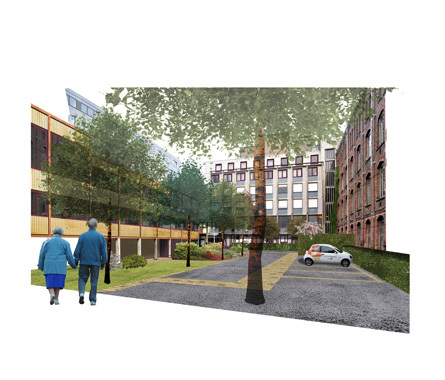 The building plot is surrounded by the rear of high, desolated buildings. Silence reigns. An industrial building as a relict of the 19th century ateliers. Beside a flat roof and a wall. There is an opportunity to build on this roof an extension for the 19th century building and create two lofts of almost 200 m2. A sketch of how it could be. The idea of a ‘first floor courtyard’. In the center a pyramid of light. Not too big, not too small. The pyramid of steel and glass will center the above (the courtyard) and the beneath (commercial space). The extension building helps to define the limits of the courtyard. The building can be simple. As if it has always been there. Simple, but essential as a drawing of a child. A swing drawn by Ilya. A horse, again by Mauro. Or is it an elephant? A building of windows and walls. And a wall of windows. Double or not? To keep it simple, details are complex. The detail works when the detail is just a detail. Wooden laminated beams structure the building and define the inner space. Access to the upper level is on the outside. Details of the stairs. 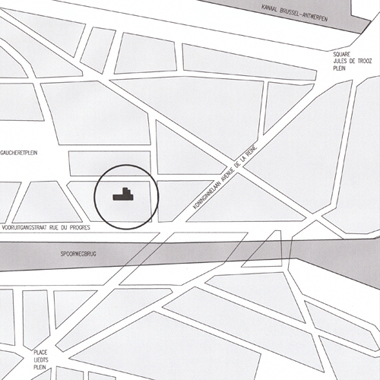 There is a large industrial site, situated near the canal in Brussels. 240 square meters. The outer views are nihil. There is no outside. There is only inside. Yes, there is a terrace, but still, no views. Screaming silence, a wonderful place to be. Everything is concrete, order and logic. There is only construction, as Industry dictated. It reminds of the cave-houses in Matera, the deep South of Italy. Light and construction. Only it is dug, not build. The materials presented are interesting: concrete, steel and terracotta-tiles. The tiles are wonderfully worn, telling us their stories, each in a different way. If we recapulate, we keep in mind: tiles, caves, light. Focus on tiles: color and texture. Focus on caves: let’s make rooms as caves. We all need a space for our own. Nobody’s fully ‘loft’like. Focus on light: structure the plan towards the main central industrial light: an attractive end and beginning. The project keeps all the existing wide and pleasant perspectives, but allows different atmospheres for eating, sleeping, reading, bathing, thinking. Red wood padouk and red ceramic tiles join the terracotta floor and sparkles the whiteness of the space. Halfway Avenue Louise, an excellent location. JLR, ‘chemises sur mesure’, from Paris takes his first steps in Brussels. What is left of a shop for clothing. Nothing exceptional, except for the wooden oak parquet. And quite big for Parisian standards. An interesting court way with beautiful steel windows. The glazing is nevertheless opaque. The plan is simple, rectangular, with some diffused light of the left. Let’s erase what is left. A first idea: introduction of plane elements in travertine marble, wood and tissues which create perspectives, depth and texture. It’s too cold, too hard, too new for JLR’s clients. Too empty. Nothing to hide, like in the National Gallery of Berlin. And so little to expose. We need displays for ties, shirts, stockings, underwear etc. Let’s keep Mies in our mind though. We should. Always. The new facade is the right choice: a simple dark wooden frame with a door and a window. A new plan with new materials: walnut for the furniture, birch for the finishing and details and oak for the floor. The emphasis lies on a warm feeling, on the exposed colors and textures of the displayed tissues and materials. Long tables and square tables aligned next to a continuous curtain, and a dominant longitudinal walnut unit, organize a structured pattern. Details for displays in the same birch-multiplex, assembled as massive blocks. They form letters, more from the same but still always different. A house with a garden. The back of the house is not made for loving the outside, not even for seeing the garden. The interior of the house is richly decorated, an art-deco treasure of the thirties. How to link the house with the garden? How to extend the house without dominating the art-deco interior? The kitchen blocks the view but it is right where it should be. The idea is to complete the house with external rooms and new views. Gradually sloping new terraces flow towards the garden and relate the formerly dark rooms to the outside. The plan follows the always interacting levels of the house. The new eating room and kitchen are in between the more intimate living room and the openness of the terrace. Playing with in and out, above and beneath, but keeping some solidness, boldness. 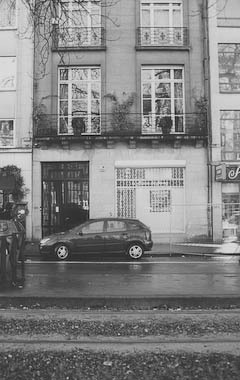 Like Loos closed and opened his house for Tristan Tzara in Paris. The new façade should link the cellar with the attic, the earth to the light. Every room will have a different relation to the garden and terraces, but will in itself fit into the whole. Glimpsing in the kitchen, concentrating in the study, pleasant in the bedroom, private in the eating room. A beautiful building in a beautiful street. An ugly café named ‘Orange bleue’: turn it into a shop, a jeweler shop for designer Christa Reniers. A plan, long, narrow, and especially high ceilings, but dark, claustrophobic and nothing of value. Unity by proportions, color and strong views. Halfway: light in abundance, from above. From the street on, let’s introduce curiosity, controlled perspectives. And we can fully exploit the length of the shop, making it infinite, mysterious, stylish. Choosing and fitting jewels, but still having a glimpse of what’s behind: the offices and atelier of Christa Reniers. The new façade should respect the building as a whole. An interpretation but definitely modern, of the 19thcentury shops in the ‘rue Antoine Dansaert’. The outer proportions follow the interior. Proportion: from the detail back to the whole. All photos by Hans Vos. 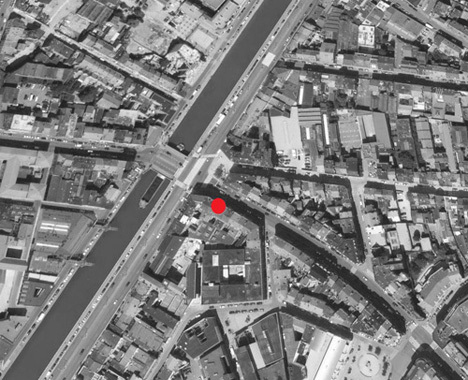 In Brussels, at the intersection with the Antoine Dansaertstraat and the canal, there is an opportunity. Everything is there: water, a bridge, a continuous flow of people and a friendly U-shape of timeless buildings. 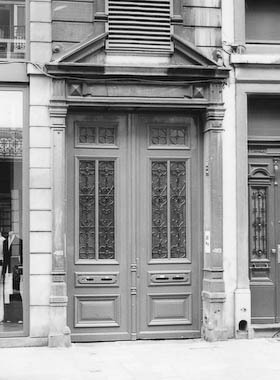 La porte de Flandre. It used to be the most important trade traffic, from the rue des Flandres to the Flanders. One day, the underestimated urban power of this area will be clear. If only some creative and - above all - political goodwill is available. Some people just go ahead and don't wait for the politicians. Here for example is a shop, to be transformed. A complete turnover in an apartmentsbuilding with a wonderful facade. 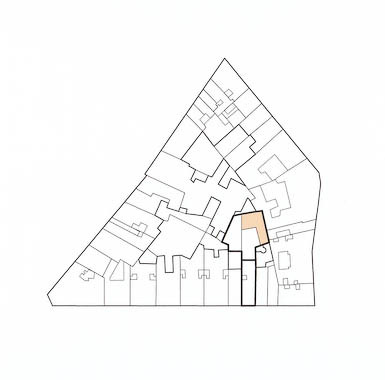 The plan of the existing situation consists of one large area with a covered courtyard and some smaller rooms. The starting idea is the 'filter'. Filtering the light, like trees and leaves filter the light in the woods. But at the same time the trees filter the views into the forest. Screens as a filter. The Machiya houses in Japan: a wooden lattice which hides the interior and filters the outside world. First sketch of this idea. The repetition of the same element: forming different entities for specific functions. So we plan a structure of boards to define new limits, views and atmosphere. All in birch wood. At the same time a guiding wall, cupboards, shelves, ceiling, tablets and furniture is designed. The ceiling as a hanging sculpture of boards.In between the technical elements(ligthning, cameras, speakers,...) are fixed. Disturbing elements in the general rythm. The handles of hidden drawers. The window as an ever changeable object, like the strings of a piano. In various positions the structure of the window showcase can be adapted to objects or to specific desires of the client. Nationalestraat Antwerp. The Flanders Fashion Institute or 'Modenatie'. At the left of the Flanders Fashion Institute there is a shopping gallery. 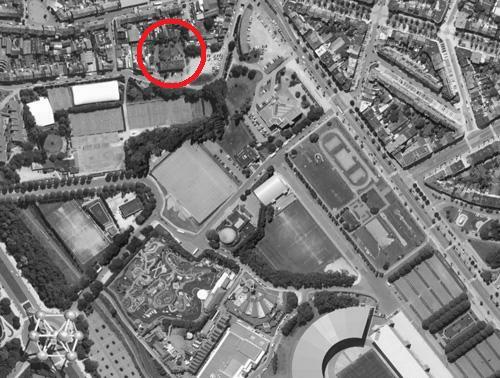 In the gallery, at the corner (in green), near the water, a small area of 30m2 is available. A glass wall around the corner, defines the shop. The plan: an entrance door, a glass wall and a column. Very small, so we think of an extreme simple gesture. The idea of the circle. A circle meaning welcome, openess, showing and receiving. Designing the circle is also designing the left-over spaces, the in-between. Louis Kahn - In the realm of architecture. Circles in the work of Louis Kahn: National Assembly, Dhaka, Bangladesh. Hospital, Dhaka, Bangladesh. Never a full circle, we reconstruct in our mind what is left-over. So if we create a circle in this almost square rectangle, we define a space in a space. The wall is free standing and serves as a partition and as a background. The proportion of the circle to the square is the most important, so that main and secondary movements can be distinguished. The detail serving the whole. Two circles as small islands, surrounded by pebbles. Guided by the light and a white delicate steel wall. Execution drawings. What is secondary is made of black plywood. The back of the steel wall is rough and unfinished. The concrete is pure and white. Electricity is basic and visible. Alongside the railway in the North of Brussels. Until the 1950�s the sweet smells of an aroma factory colored this area. Then later it was used as a small theatre, now the client wanted it to be converted in offices with a social purpose. It is a longitudinal volume, situated in the middle of a building block. No views to the outside world. The only light comes from above. A ground floor for the machinery, and a balcony that goes all the way round. In 1908 Peter Behrens designed, on a larger scale, a giant machinery hall in Berlin for AEG. This factory has got a nice concrete structure with central zenithal light. After pouring a new concrete floor, we will have to divide this wonderful space. 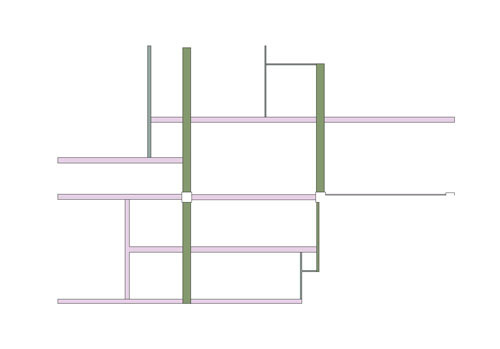 The client wants as much square meters as possible, so we split the building in two levels. Only a central area, with the stairs and elevator, will maintain its two-storey character. We just fill in the spaces between the balconies, to create a first floor. The space between the existing balconies and the new parts will be filled in with glass. The northern wall, blinded in this picture, is the only wall where we can have a view. Here we propose a facade with a wall in steel and glass that matches the volume behind. The main goal was to create a flexible layout, where smaller and larger offices are easily connected by a central staircase and a circulation in direct contact with the existing offices and cafetaria in the nearby buildings. Full Flanders landscape. A small farmhouse: to be extended for a large family. Situation: lovely high trees and a nice bent in the road. The plan is what it is. the spirit of a farmhouse What shall we do? Hugo Haring made beautiful cow stables in the 1920's at Lubeck. The materials are typical for the farmhouse, but the volume isn't. It looks unusual, not common, yet modern. Here's the man. Functionalism in another way: expressive and sensitive. In the old farmhouse, we look for interaction between the small attic and the ground floor. We will not touch, but maintain its character. Instead of changing the old, we'll just add a new wing. The 'sleep and wash' -unit for the family. But we will bring clouds and trees inside, sunshine and views on the beautiful surroundings. The new house is L-shaped. All rooms are always referring to itself and its inner heart -the garden. When moving around, you come across the other - outer - world. Slightly inclined lines determine the views and articulate the delicate movements. First we tried a metal skin of curved panels but the council wasn't too favorable. So we stayed with an untraditional use of used bricks and black tiles, and we focused on the articulation of the volumes. With thanks to Tom Callebaut for the collaboration. Not far from the Atomium. 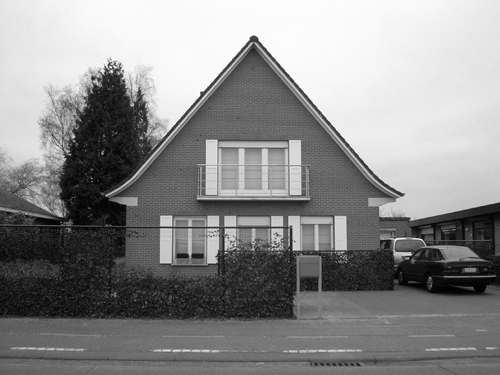 A competition for a nursery school in collaboration with architect Stefan Van Moll. Client: the city of Brussels. Terrain: a worn building to be demolished, in a strange urban landscape. A village-like street, small houses at the right and at the back. A sloping landscape of sport terrains at the front. A plot of land with a deserted area at the right. We gather classes and staff rooms, and smoothen the form following the building plot. A pebble! A pebble as an irregular beauty with fast and slow curves. It fits in the plan and leaves us a wonderful garden for the children. First floor, halfway down the street-level: all major functions as gym, media and the classes for the smallest children, accessibe through a gently sloping ramp. Second floor: all classes with a central staircase and relaxing zone. No corridors. So the plan looks like an UFO, landed on a green area. An ecological UFO, with its compact volume and its rational facade. Final plan 1: the concierge in the left of the garden, all main and more 'public' functions with offices and staff. Final plan 2: all classes have different views and relation with the exterior and are easy to control because of the central layout. Final plan 3: The facade as standard insulation panels with metal, glass or transparent cladding. Zavel-Sablon. 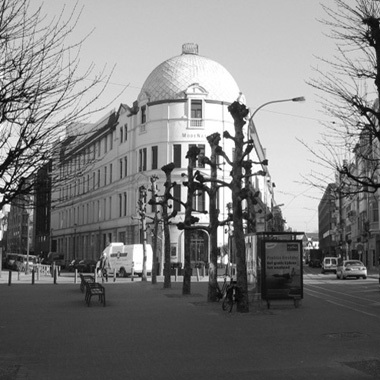 The lower part at the roundabout, opposite Taschen. The existing situation is a rectangular plan, with quiet a low ceiling. At the end there is a small courtyard. We are in search of class and style. Like Marcello Mastroianni in La Dolce Vita. Or like the Case Study House nr.21 of the architect Pierre Koenig. Photo by Julius Shulman. Black and white. Distinguished and cool. Michelangelo Antonioni's movies: here is his shadow and reflection. Antonioni: La Notte. 1961 but still modern and sharp. Timeless by tension and alienation. First we add structure: black steel L-shaped columns make the ceiling higher, the perspective sharp. Then we introduce functionality and horizontality - tablets. And finally the furniture guides the circulation and lightning emphasizes the layout. Almost the same volume, but a complete new experience. In the center of the attention: floating furniture in black and white steel. Boxes in steel show jewels for sale. You walk around and around. Starting point: window boxes. In between: rigid columns and swinging boxes. End point: a confusing grid. Open but private: an irregular and playful motive towards the light of the courtyard. 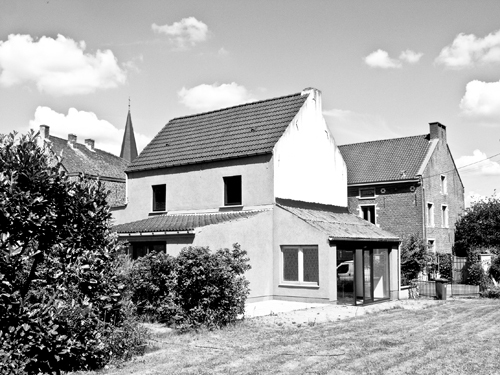 In a small village near Leuven, near the church, a couple decided to transform the house they just bought. A great big garden in the back, the quiet and peaceful village just in front. 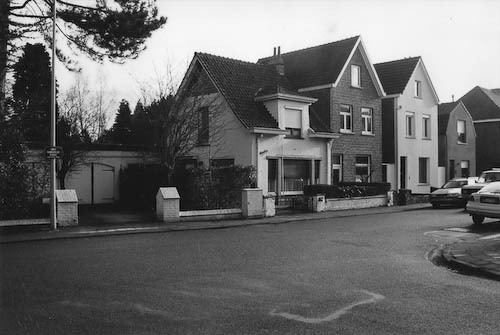 The house had been transformed several times before. But the result was a complete mess. Uncomfortable spaces, strange circulation and not practical at all. After a while we noticed interesting views, the church. The neighbor's house in front. The plan of the house. Rooms next to each other, a dreadful circulation. Together with Tom callebaut, we worked out a first idea. Let's build a second,new, living area in the garden, and restore the old part. In between we fit the new stairs and a new entrance. Or maybe reducing the new volume and and move it more towards the old part. Or maybe just next to it? The new part will be far too expensive, too big. We need smaller solutions. Just adding, rebuilding, removing... like here in Semarang, Indonesia. The process of transforming. The Belgian building system. Remove, adjust, add. What we add: staircase and kitchen. We remove: what has been previously added. We adjust: a new circulation near the front facade . What we get: a sequence of clearly defined spaces: entrance, office, living, dining and kitchen leading to an open staircase. The stair connects the different levels in an opposite direction. Well chosen openings relate the movement to it surroundings. Everything we added, filled in, or opened up, will be expressed in the outer look of the house. Every side if the house is different. New facades will alter with transformed parts or existing details. What is this? The London tube? No, just concrete beams. Concrete beams in a casco loft surface in Brussels. First thing we do is sandblasting all the beams. The loft has only two sources of light. The back of the loft, with a terrace. The terrace with view on a nice appartment building by architect Liebaut. Second source of light. Window on street. We divide the loft by walls of concrete blocks, like we divide a city. Streets, squares and circulation. What is left, is hidden. A new grid is created. Adding a free-standing circular bathroom, as a sort of lamp, some kind of funrniture. The two bathrooms allow the possibility of two bedrooms. So we have: concrete beams, concrete blocks, a white steel bathroom and wood. Lots of rubberwood to counterbalance. Doors, desk, closets, kitchen,... all will be detailed in wood. John Lautner's Shaffer house, California, from 1949, is always a great source of inspiration. Neverending perpspectives and clearly developped from the inside. Likewise the 1969 Walstrom house. It is the inside that counts. As in lofts, we only have the inside, we have to take care of it. Carefully details are developped. For example the bathroom in etched glass. What makes a house a house? The road leading to the house, the roof protecting its inhabitants, the garden around the house, the views from within the house. The back of the house, the house as a growing object like the people living in it. First the house was simply rectangular. Then cam the need for a garage. And the need for a veranda. And what now. First idea. A volume in the opposite direction, a pavillon in the garden. Long and low, longing the garden, free and light. Luxury. With superb views and softening curbs. No, the council said. Keep the garage and make something out of it. OK. We clear out the volumes, and put them in a simple relation. Like Van Mossevelde did in St-Martens-Latem in the seventies. Two walls and a view, nothing else. Kitchen, dining room, living area reorganized. White brick, grey Padouk, in a vertically articulation. The details of the stairs are developped in the same way, in gentle and smooth Oak.